I can be pretty slow at times, especially when I ride my bike. But that’s not necessarily a bad thing. As the only person actually peddling on a road where others are simply pushing a gas pedal, I notice a lot. And a gate that, for all I can tell, is completely ineffective. 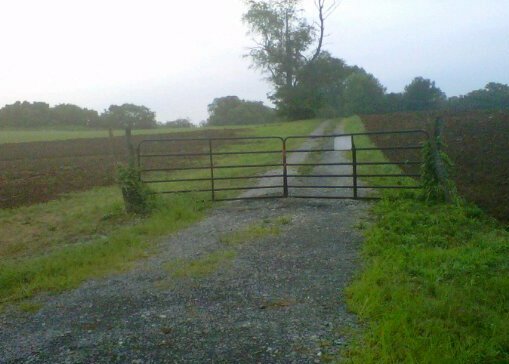 The gate crosses a gravel road that runs between two fields. 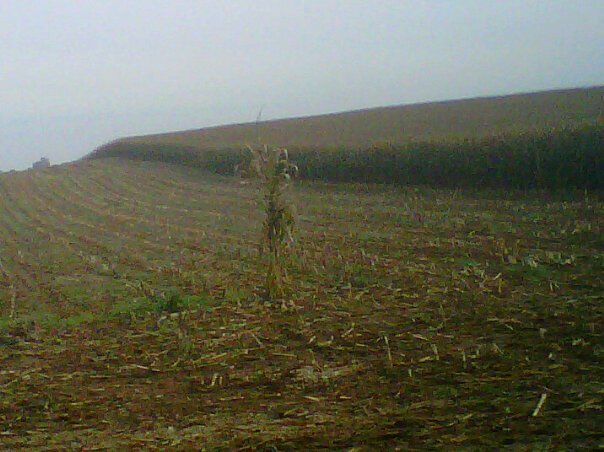 Until this week, green stalks of corn filled one of the fields, while the other had no discernible crop. This week, both were plowed. So the road now runs, and eventually dead ends, between two muddy, empty fields. Other than providing farm workers easy access to the fields, the road doesn’t serve much purpose. It certainly doesn’t lead anywhere interesting or provide enough privacy to be a lovers’ lane. Because of that, the importance of a locked gate with a fading private property sign eludes me. Since there is no fence on either side, the gate isn’t really preventing anyone from simply driving around it. After passing the gate day after day, I finally took a picture and posted it on Facebook with a question about its purpose. I got a variety of responses ranging from people who took the question seriously to those who didn’t. The general consensus was that there had probably been fences around the fields at some point. When they were torn down, the gate stayed to mark private property. While this concept still puzzles me, it also reminds me of human behavior in general: we often tear down fences but leave gates standing. We say we believe in equal rights and demonstrate this by tearing down barriers for others. Yet we still leave up gates to protect what we believe we earned or deserve and fear others may access or take away. Sometimes these gates are words. Sometimes they are the policies we support. And sometimes they are even religious beliefs. But whatever the reason, the gates are there. And, just liked the locked gate I pass every day on my bike, they provide a false sense of security for some and serve as a challenge for others. At times, I know I’ve protected my own gates. But the rebel in me also spends a lot of time thinking about how to get around gates. And I admit, there have been many times when riding my bike on the country road, I’ve been tempted to ride around the gate. The silliest thing is I would have no desire to ride on the gravel road if the gate weren’t there. I certainly don’t want to cause any problems or do any damage. But then, I don’t think people who are seeking greater opportunities have any desire to trample on the achievements of others. They just know the possibilities would be endless if they weren’t constantly slowed down by so many locked gates. Posted on August 5, 2012, in My life, Uncategorized and tagged bicycling, country roads, equality, facebook, farms, life, lifestyle, musings, perspective, purpose. Bookmark the permalink. 82 Comments. Beautifully expressed! I’d love to see that fence, and those fields. Great metaphor! I grew up in the heart of Philadelphia, but always loved the country. Now I live in the burbs, not far from the country actually. 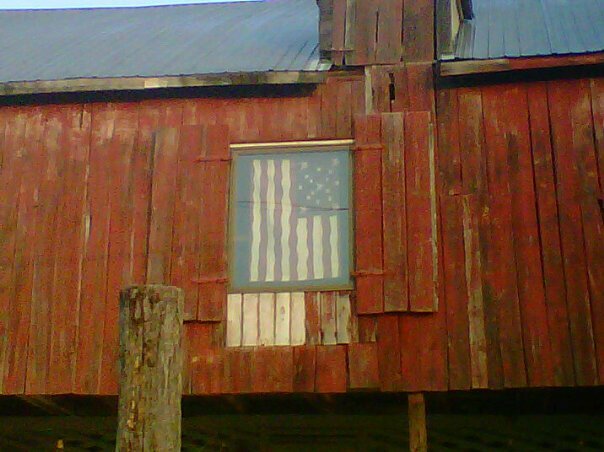 I love country roads, old barns, rusty gates, woodworking, and a slow pace. This all brought that to mind…nice..
All my life I’ve gone from thinking I’m a country girl to a city girl… right now, I have the best of both worlds! What a great post! It does provide a great deal to contemplate and I will certainly look within myself to access where I might be lacking or stronger with my own gate(s). Thank you for making me think about these points in my own life and how I may make personal changes. Congrats on being FP! Check out my site where fences of all kinds reside…and a lot more! Interesting thoughts about the gate. I wonder if there is some farming explanation – I’ve seen the same phenomenon on farms around here, but in the mean time it makes for great allegory, and got you Freshly Pressed. Congratulations on that. Of course I know Shepherdstown! My husband’s family is from there! An interesting observation of the minutia of life. Bike riding can be very cathartic and certainly one can become philosophical. Long moments of mundane pedaling at slow speeds allows us to examine details around us, and to “see” things never seen before. Love it… and it’s good exercise too! Beautiful pictures; a wonderful metaphor for how we live our lives. Simply driving around that gate would be appeasement, sort of a political compromise. I want to get to the other side, and opening the gate would be wrong. But if I just slipped on by here and didn’t consciously commit an unjust act, I simply wandered. You can’t hold me responsible, I mean, I didn’t break the law, I just simply went around it. I also see it as country versus city values. In the city, a gate without a surrounding fence would be taken as no gate at all. I mean, you’re not really serious, are you? But country ethics need only the gate to say “Stop! and go no further.” And most would oblige. That’s how I see it as a city boy. Thanks for the images, both visual and intellectual. So true… love the perspective! Thank you so much for your wonderful pictures and words. It was very inspiring and gentle which helped make your message all the more powerful. Ah, the country roads! Haven’t seen them in a while. These remind me of the Kent Farm in Superman, LOL. Since I live in West Virginia… we love our “Country Roads.” That’s the song we all sing when we cross the state line! Gorgeous thought, and nicely turned from a casual observation into something to truly think about. Congratulations on being Freshly Pressed! Great thought-provoking post. When I visited southern Texas I saw road-crossing gates with NO FENCES! These were often elaborate, custom-made gates. Sometimes the gates had detailed landscaping surrounding them. Frequently, a simple barbed wire fence would have a dramatic, expensive gate. Also, I sometimes saw this growing up in Iowa. I’ll have to ask my grandmother, who still lives there, what she thinks it means. Congrats on being FP! That’s interesting….but, then, people are interesting! Thanks! The cornfield looks like home to me, I’m from Nebraska. I enjoyed your post, and I’d like to congratulate you on being Freshly Pressed… that is so awesome!! Thanks! I think it’s awesome too! An interesting concept but truthfully not complete in its conclusion process. I have been a city boy (born in New York) and I have worked in dairy farms in the summers in upstate New York. Currently in our soon retirement we are seeking to buy a small farm between 20 and 50 acres in East Texas for both an organic farm operation as well as a small wine vinyard: http://lonestarorganics.com My wife and I are both seventy. This goal is considered unusual for folks of our age. Part of the reason is my wife is a two time breast cancer survior and believes this lifestyle will extend our lives. It is my belief that these WordPress Blogs represent our own individual gates to our lives. The sign out front says “Welcome,” we are willing to share ourselves with others. This truly is what makes the WordPress family such a great community. I should know, I have had my blog with WordPress going on five years. Best wishes with your endeavors! Thank you Trina. Blessings in your journey. What an inspiring and thought-provoking post! I am currently searching for other opportunities that I have previously seen as closed due to the gate that was up in front of them. Only now have I decided to try to go around that gate and see what really does exist at the end of that road. Thanks for posting! That’s what’s so interesting… if the gate wasn’t there… I would have no interest in the road at all! interesting observation…..have you ever attempted to remove a gate post?……hard work…..i think thats why the gate remains…………. Reminds me of the beautiful stretch of dirt road leading from my parents property in the Adelaide Hills. There is nothing like a long walk on a foggy winter day, rugged up against the cold. Following on from what thegreatgodpan1 said, if the gate posts are difficult to remove, perhaps the gate is locked so that it doesn’t swing open and cause an accident? Good post of yours, though! It only occurred to me when I read the comments! I enjoyed this post. I live in the country and have seen gates like this. It does make you ponder the reason behind the left gate. Why? It makes you instantly curious. Sometimes it is the fear of the other side that keeps us from going around the unfenced gate. Great post. Interesting thoughts. I lived in Hungary for a few years, where all yards (and I really mean just about all) have fences around them. Quite often, the houses have lovely gardens — vegetables, flowers, fruit trees, nut trees, formal, informal. In either case, I can see what they’ve got to protect. I was always intrigued by the little worlds behind those fences and told my landlady how much I loved them. She laughed. She has relatives in the U.S. and had visited Indiana a couple of times. She told me how she’d loved it that there weren’t any fences around the yards, the openness it implied, although there are not nearly so many gardens here. I also saw an elaborate gate once along a country road somewhere in Eastern Europe. It was in the middle of nowhere, but the fact of the gate was a reminder that it wasn’t always “nowhere” there; at some point, there had been something large and important either there or not far away. I took a photo but it didn’t turn out, which disappointed me, as it was such an evocative sight, even poignant. Nice blog, and congratulations on being FP! Fences say a great deal, don’t they? In the newer developments around here, no one shares fences. Everyone has a fence that goes around their yards, but there is space, almost like a maze, between all the fences. Of course, then the issue becomes who maintains the space between the fences? interesting stuff. my boyfriend and i often talk about society’s need to make us all “feel scared” or “insecure” in our homes or our lives, and i’ve often thought it was just city thinking..but i guess it exists in the country too. that property would be no less safe without the gate..it’s very interesting that we need things like that to make us feel safe and secure. I think people in the country are going to be much more willing to welcome a stranger into their home, but they have to be invited in first! I really enjoyed your post and its wider ramifications. Also with overcoming problems in our lives we fixate on the gate but don’t try to go around a problem or barrier. I’m Australian and I really enjoyed seeing Sally Pearson win gold in the hurdles at the olympics. I never liked doing hurdles myself but I was very impressed with her not only jumping them at speed but also in the rain and winning the gold medal. So true… thanks for the feedback. You’ve given me something to think about beyond your enticing photographs – where have I removed fences but left gates? I, too, would want to travel down that forbidden though tantalizingly accessible lane. Congrats on FP and an engaging post! Taking pictures of barns, pastures, gates, and paths is one of my favorite pastimes. Nice to find a kindred spirit. Great Post: However, the fields weren’t plowed. They were just chopped for silage. Doesn’t look like any ground work was done at all actually. Plowing is an outdated practice. The drought has caused a lot of fields to go to silage. Even those that are irrigated and look green. And the gate serves a purpose when there is an electric fence up-over the winter time. I learned something new today… thanks! Thanks… it’s so rewarding to have so many people read wha I love to write! Thanks… it’s so rewarding to have so many people read what I love to write! Many people have already expressed their reflections, which are much similar to mine. I have some food for thought now too. Don’t you just love when you read a blog post that turns on the ignition of the creative drive? It always leaves me with my next idea. That’s what makes great bloggers, isn’t it? Love it! And I love how the most mundane comments spur the most creative posts. “we often tear down fences but leave gates standing” was so beautifully said. I try to read Freshly Pressed blogs daily, your was at the end of my reading list by chance. Thankfully, it was my favorite. My mind works the same and I’ve captured those daily thoughts that have more spiritual and philosophical roots in some blogs as well. Yours was truly a pleasure to read. It reminds me of Walt Whitman’s lines, “Unscrew the locks from the doors! Unscrew the doors themselves from their jambs!” I’ve tried to live by those words that there should be no barriers between myself and others. But you put it magically, even though I believe I’m forward thinking and am open to the world, those gates are still up even if the fences have been removed. Thank you for sharing! I love this! And reading others replies. . .
Trina, I think like you. I can’t go on a country walk without my camera in hand and I’ve taken pictures of gates before and have written several times in my morning pages pondering on these locked gates. Yes a very thoughtful metaphor. If the gate were not there, I’d continue riding along. Well -acquainted with Western values however, I ALWAYS respect private property. Ranchers have cattle leases on public lands as well as own their own spreads. The Midwest like Iowa, or Illinois have crops . Of course gates are meant to be opened and closed, usually keeping horses, beef IN, not necessarily to keep us out, but I respect the boundary. With freedom comes responsibility I think. Good luck! I spend a lot of time in nowhere doing “geodashing” (an Net-based GPS game) and encounter many gates and roads as you describe, and often as you describe with no fence. This puzzled me too but it appears to be related to property rights and easements. If access to the road is not denied then others can use the road and after a while have created a right to use the road. The second factor is hunters. Since they’re unlikely to get out and walk the gate is a valid no trespassing barrier (in many states land itself has implied no trespassing). As a metaphor I’ve also seen lots of gates, signs, other kinds of barriers protecting absolutely nothing or some collapsing buildings. Were these urban places where druggies and vandals might show up the barrier (even though ineffective) might make sense, but in the middle of nowhere, what is the purpose. In many instances I thought it is just protecting the nostalgia of the place, that once it was thriving and now it is abandoned, so those barrier protect memories. Quite profound! Love the analogy! What I also find just as fascinating is that even when gates are unlocked and fences are down, some people behave as though the barriers remain and limit themselves from those endless opportunities. I liked your blog, Trina. I am just getting started in mine, but seeing those country roads and the locked gate reminded me of riding in the country in MI and I took photos of country barns that were unusual or worn. I may post those photos on my blog sometime. Thanks for the inspiration. Wow… you are so welcome. Where in Michigan? (My mom is from there. We were in the upper peninsula of Michigan in Hurley and Ironwood. They are on the border of Wisconsin and we traveled in Wisconsin too. I have photos of the barns but I will have to find them in my computer. I just drove through your neck of the woods! We were driving from Fredericksburg, VA to New Martinsville, WV (actually just posted an entry about that trip). Congrats on the FP. I enjoyed your blog very much. I had a similar situation occur when I was a child. I watched an old neighbor whitewash an old wood fence every year. It took him two days. The pasture had been empty for years. When I asked him why he kept up the fence that way, he told me, “Because it’s easier to paint it than to tear it down.” Your story brought back that memory. Thanks. Interesting… and thanks for the feedback! Thanks! They were taken with my Blackberry! Food for thought. Do we look for ways around the things that block us from reaching our dreams?